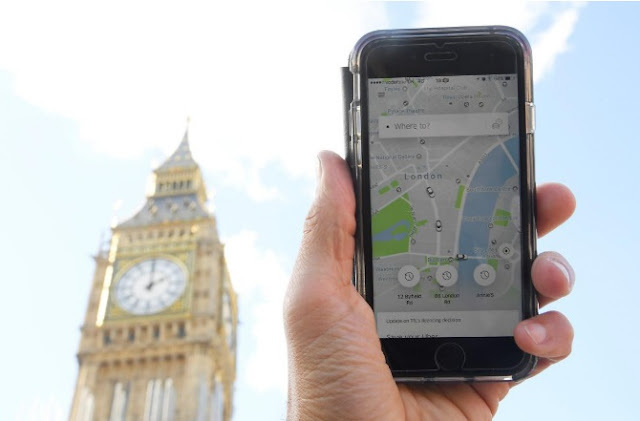 A photo illustration shows the Uber app on a mobile telephone, as it is held up for a posed photograph in central London, Britain September 22, 2017. LONDON - Uber called on Monday for talks with London’s transport regulator as soon as possible and pledged to make improvements in the way it reports serious incidents in a bid to retain its license. On Friday, the British capital’s transport regulator deemed Uber unfit to run a taxi service and decided not to renew its license to operate, which will end this week, citing the firm’s approach to reporting serious criminal offences and background checks on drivers. London police complained earlier this year that Uber, which is backed by Goldman Sachs and BlackRock, was either not disclosing, or taking too long to report, serious crimes including sexual assaults and that this put the public at risk. Asked about the criticism, Uber’s UK Head of Cities apologized about a specific incident and said the firm was working with the Metropolitan police to make improvements to its reporting process. “We’re working with the police to figure out how we can do this in a better way that’s helpful to them,” Fred Jones told BBC radio. But he also called for talks with regulator Transport for London (TfL) to discuss the loss of the firm’s license, which formally ends this week. The firm can continue to operate until the appeals process is exhausted, which is likely to take several months. “It’s just not clear for us what their concerns might be,” said Jones. “Once we understand them we can work with them to figure out what is it that they would like us to do and how can we move forward and I think that’s the important next step,” he said. TfL declined to comment on Monday. But the Mayor of London Sadiq Khan, a Labour politician who has criticized the firm in the past, backed TfL’s decision and attacked the Silicon Valley app’s response. “You can’t have it both ways: on the one hand acting in an aggressive manner for all sorts of things but on the other hand brief to journalists that they want to do a deal with TfL,” he told BBC radio. Uber called on Monday for talks with London’s transport regulator as soon as possible and pledged to make improvements in the way it reports serious incidents in a bid to retain its license.